Nope. It is MOW. Better known as Meals On Wheels. 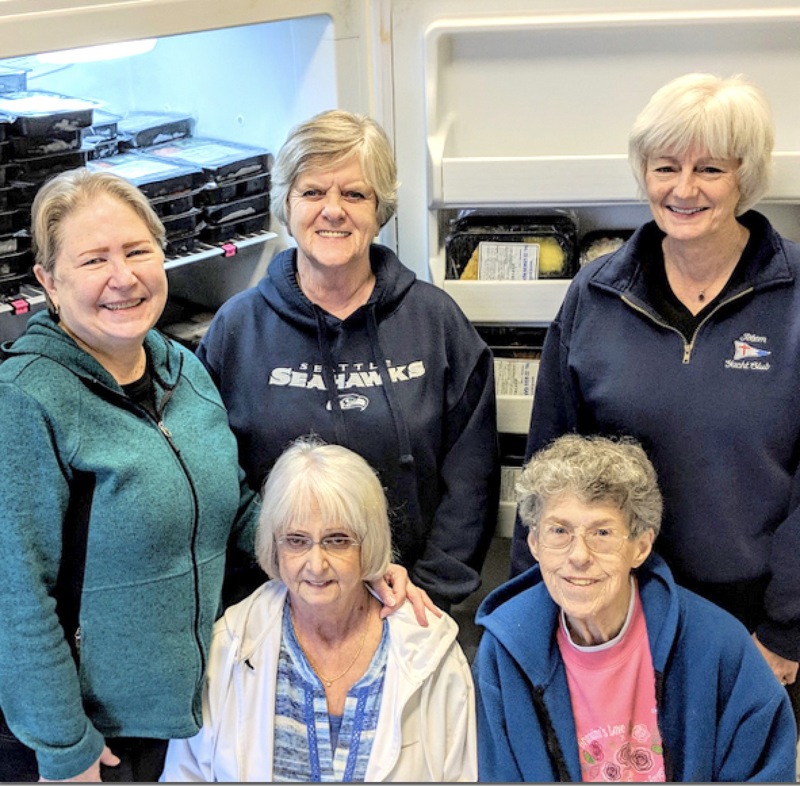 With smiling faces, five women volunteers meet every Wednesday morning near the Burien skate park at the Burien Community Center Annex to begin a labor of love. They are the local chapter of Meals On Wheels, a Sound Generations facility that produces prepared meals for local families or persons 60 and older who cannot afford and/or cannot get out easily to shop for themselves. From a small anteroom, adjacent to an entry door to old classrooms from the former Chelsea Park Elementary School on 144th S.W., sits a room that once held playground equipment for school kids. It is now the operation center for storing and distributing those 475 frozen breakfasts, lunches and dinners in microwave-able packs. Burien residents who qualify and sign up can have five meals delivered each Wednesday morning for a nominal charge or even free in many cases. Residents can choose from a menu provided by Sound Generations, who contract with Airline Catering of Spanaway, Wa., to prepare meals such as Mexican Skillet Dish or Lemon Pepper Fish. Even a breakfast burrito or biscuits and gravy are available. An added feature are low calorie meals, low fat meals and vegetarian dishes. Volunteer drivers line up around noon each Wednesday to load their personal vehicles with dozens of meals for their trips around town. The packed paper or canvas bags are filled with specific orders for different customer needs. There are low sodium meals and low fat and vegetarian packs like cheesy vegetable bake. Heartier meals such as meatloaf or Salisbury steak are popular. All the meals are prepared in microwave or oven-ready containers. The group of women behind this effort have a combined 50 years of service to the nearly 100 local residents in the Highline area. Jan Nickell, Monda Rojas, Teddi McDougall, Sonja Gower, Heidi Foote could not even begin to work without Gebby Biadglign, the happy-to-see-you driver for Sound Generations.